﻿ A Typical Day of biking with Provence Cycling Holidays, self guided bike tours in the Luberon, Provence, France. A TYPICAL DAY AT THE VILLA. Following are examples of 2 days' cycling for the 2 extremes of cyclists (those that want more sight seeing than cycling, and those who focus on the miles). Remember most of us are somewhere in between these two groups. Of course these itineraries are not set in stone, they are just an idea of what a couple of your days riding could look like - it's up to you. We will of course point you in the right direction, so you can make the most of your time. 1 - A small amount of bike time with more of an accent on Tourism. Day 1 example includes: The pool, a ride to Gordes village for lunch, then onto some Wine Tasting and Dinner at a local restaurant. 9am - Start the day with some fresh croissants and coffee on the terrace, in the morning sun. 9.45am - Take an hour in the sun, lounging by the pool in the landscaped garden with that book you've been meaning to read. 11am - On the bike for a ride to breathtaking Gordes (image to the right), classified as one of France's most beautiful villages. 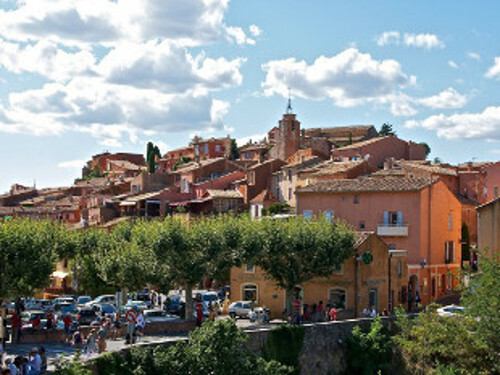 1hr on quiet back roads, through the sights of the Luberon valley & vineyards. 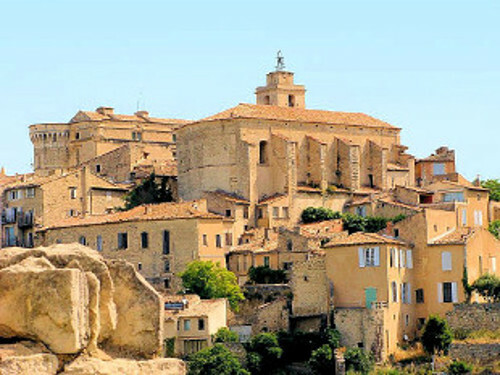 Take a stop at the ancient "Village des Bories" and visit the stone buildings that Provence is famous for. 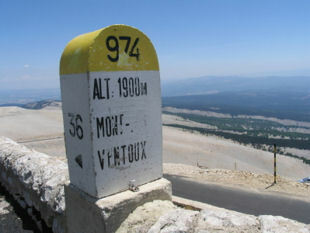 12.45pm - 15 minutes on the bike and the final climb to Gordes (the easiest way) with its breathtaking views. 1pm - A leisurely lunch in one of the many village restaurants, we'll provide recommendations. 4pm - Back on the bike for 45 mins, enjoying the down hill & the country lanes. Maybe stop in Coustellet at the wine cellar, for some tasting, before heading back on the old train track bike track, flat & easy. 6pm - Back at the villa for a freshen up, and relax and enjoy the pool before dinner. 7.30pm - Drinks on the terrace, then off to one of the local villages for a pre dinner walk, and choose one of the many excellent local restaurants from our tried & tested list. Total bike time for the day (approx) : 2h to 2h30. 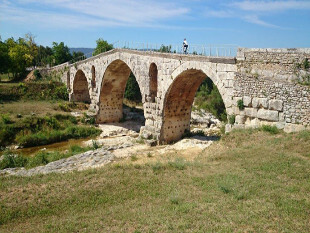 Day 2 example includes: A gentle ride to Isle sur la Sorgue through the orchards, a visit to the market & a great lunch, Fontaine de Vaucluse, & the French resistance museum & a relaxing al fresco dinner at the villa. 9am - Take a seat under the pergola, and enjoy some pain au chocolat and superb fresh fruit from the village bakery and local farmer's market. 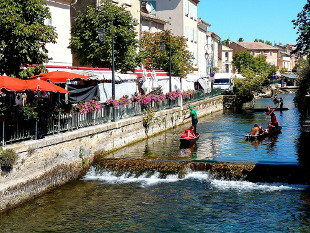 10am - 45 mins flat riding through the orchards to the town of Isle Sur la Sorgue (known as "Venice of Provence"), take in its many water ways & its dozens of authentic antique shops and the large market. Then a relaxing lunch at one of the numerous riverside restaurants. 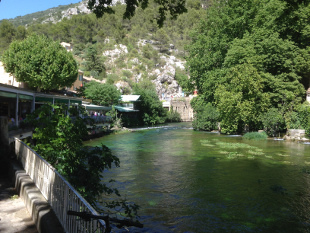 1.30pm - 30 mins scenic riding to Fontaine de Vaucluse - walk along the crystal clear Sorgue river, then up to its source. Have a drink by the river & the old bridge and take in the atmosphere. Visit the interesting resistance museum to see how people here lived during the war. 4pm - 45 mins on the bike on the flat through the farmlands to home. A cool down in the pool, followed by drinks on the terrace. 7pm - take your time and unwind over a home cooked dinner at the villa, enjoy the warm evening. Total bike time for the day (approx) : 2h00 to 2h30 hours. Day 1 example includes: 3hr ride in the Rhone river and the Vaucluse hills (Lunch out), Pool, 2hr ride inc the rail bike track, Dinner at a local restaurant. 10am - On the bike for 3 hours in the quiet & beautiful hills and then onto the plane through the fruit orchards, taking in the villages of St Didier, Fontaine de Vaucluse & L'Isle sur la Sorgue. 1pm - Lunch stop at the village cafe in Robion. 2.30pm - 10 min ride and its back to the villa for a swim. 4pm - Out for a couple of hours taking in some of the designated bike routes and the old railway bike track as well as some of the renowned hilltop villages and their cafes for a well earned pit stop. 6.30pm - Back to the villa for a freshen up and relax before dinner. 7.30pm - Drinks on the terrace, then off to one of the local villages for a pre dinner walk, and the choice of one of the many excellent local restaurants from our tried & tested list. Total bike time for the day (approx) : 5 hours. And then the enjoyable 30 min descent back to your start point. 3.30pm - Back in the car and towards the villa via the Sault lavender fields. 4.15pm - Stop off at Goult, a pretty village off the tourist circuit topped by its Windmill and Chateau. A sign-posted walk takes you from the mill through the narrow village lanes taking in various buildings important to the village's history. Finish the visit at the atmospheric café on the square dominated by the church. Then the 15 mins car journey to the villa. 6pm - Back to the villa for a swim and freshen up before dinner. 7.30pm - Take your time and unwind over a home cooked dinner at the villa, enjoy the warm evening outside. Total bike time for the day (approx) : 1h 45 to 3 hours. "The area is full of beautiful villages and towns, all with a great choice of cafes and restaurants for lunch or for the evenings when dinner is not provided. Neil and Nat can advise on choice of restaurants and are also a fund of info about the area." 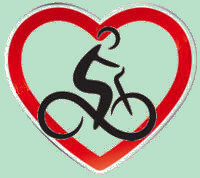 Click HERE to read more about our Bike & Equipment.